Schools in UP asked not to celebrate Christmas and carolers arrested in Madhya Pradesh part of a worrying trend. Christian schools in Uttar Pradesh’s Aligarh have been warned by the Hindu Jagran Manch, a Hindutva group, against celebrating Christmas, as it “might lure students to Christianity”. According to a report, the city president of Hindu Jagran Manch, Sonu Savita, said Christian schools were asking students to bring toys and gifts to class, which was “an easy way to lure them to Christianity”. The Hindu Jagran Manch is affiliated to the Hindu Yuva Vahini, which was founded by Yogi Adityanath, the chief minister of Uttar Pradesh. A report in The Guardian in January 2017 said India had moved up in a list of countries “where the practice of the faith [Christianity] is a high-risk activity”. India rose to No 15 on the 2017 World Watch List, up from 31 in 2013, in the list compiled by Open Doors. In the first week of December, Mathura police arrested seven Christian preachers for allegedly carrying out a “forcible conversion campaign” in a village in the district. In April, the police stopped a prayer meeting attended by more than 150 people, including 11 American tourists, at a church after Hindu Yuva Vahini complained that “the event was a cover for religious conversion”. The group had filed a complaint against Yohannan Adam, the pastor of the church in Maharajganj district. Uttar Pradesh is not the only state where Christians don’t seem to be having achhe din. On December 14, a group of priests and carol singers was detained in Madhya Pradesh’s Satna on a complaint backed by the Bajrang Dal. Eight priests, who went to the police station to inquire about the detained priests, were also held. A vehicle belonging to them was set on fire outside the police station. On Tuesday, December 12, Maharashtra chief minister Devendra Fadnavis' wife Amruta Fadnavis, was trolled on Twitter for launching the Be Santa campaign for underprivileged children in Mumbai. On Saturday, December 17, Mumbai BJP president Ashish Shelar was trolled for supporting a pre-Christmas event, an annual programme at Mumbai’s Girgaum Chowpatty. On October 23, 2017, Hindu Jagran Manch activists in Indore made seven children alight from a Mumbai-bound train, where they were headed for a Bible reading class, and had them rounded off to the police station along with the adults accompanying them. In June, a Catholic nun and four tribal girls travelling with her by train were detained, after the Bajrang Dal complained this was an attempt at conversion. The nun said she was escorting the girls, who hailed from Jharkhand, to study in Bhopal. In April, three Christians were arrested from a village in Khandwa district, also in MP, on charges of converting people. Similar incidents have been reported from many other parts of the country. 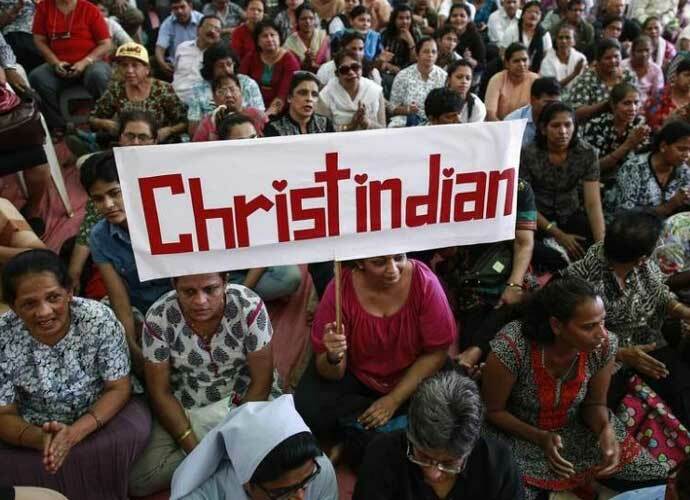 So why is Christianity under attack in India? While the central government cannot be held responsible for everything that goes wrong in the country, the link between the BJP’s ascendance to power and the increase in the number of such incidents is difficult to ignore. The ruling party can be faulted on two counts – that of casting all minorities as “others” in its bid to consolidate the Hindu vote bank, and for failing to act against the more violent foot-soldiers of its ideology. Distrust of Christians is not new among a section of the country. While Right-wing hardliners believe that India should become a Hindu Rashtra, others suspect missionary activities to be a cover for religious conversions. In a country in which Christian missionaries run some of the most famous educational institutions and hospitals, and those in very remote areas, there has always been a sneaking suspicion that they “lure” people, especially the dispossessed – Dalit Hindus, tribals, et al – to Christianity by promising education, inclusion and other benefits. However, that has not prevented people of all communities from making a beeline for missionary-run schools, especially as they are reputed, to ensure their children learn “good English”. In an attempt to consolidate its vote bank, the BJP has, for long, sold a narrative that Hinduism is under threat, by the increasing population of Muslims, by the conversion attempts of Islam and Christianity, and by the minority appeasement practised by other politicians. As the party has become more powerful, the narrative has found more acceptance – the ruling party articulating what people vaguely suspected lends powerful credence to the suspicion. The simple answer to the increased attacks on the community, and also the absence of outrage over them: bodies such as the Hindu Jagran Manch and the Hindu Yuva Vahini have become emboldened, feeling they can carry out their agenda more openly under a “sympathetic” government, and the general populace feels that unless minorities are kept in check, Hindus will be under threat in their own land. Hard facts, such as the Census data that Christians comprised 2.3 per cent of the population in 1951 and their numbers have gone up to just 5.84 per cent till now, easily get lost in the face of sustained emotive rhetoric. While the BJP has vocally denounced conversions from Hinduism, bodies affiliated to its parent organisation, Rashtritya Swamamsevak Sangh, have openly talked of “ghar wapsi”. Hindu hardliners believe that every Indian was "originally Hindu", and has either “deviated” or was coerced into embracing monotheistic religions such as Islam or Christianity. This scattered flock now needs to be brought back to the Hindusim fold, by way of a ghar wapsi, or homecoming, and various Hindu groups have organised such mass events. One such much-publicised event was to be organised in Aligarh on Christmas Day in 2014, and was called off only after major uproar. In the cases listed above where Christians were booked, complaints were filed not by common citizens or those being “forced” into changing their religion, but by the many shades of saffron now rampant in India. Religious conversion, and even seeking to spread one’s religion, is not illegal in India. Article 25 of the Constitution grants every one the “freedom of conscience and free profession, practice and propagation of religion”. Six states in India – Arunachal Pradesh, Odisha, Madhya Pradesh, Chhattisgarh, Gujarat, and Himachal Pradesh – have anti-conversion laws. These laws are remarkably similar, and ban conversions through “force, allurement, inducement or fraud”. Jharkhand, in August 2017, passed an anti-conversion Bill, and a similar Bill from Rajasthan was recently returned by the Centre for clarifications. The problem with the existing laws is that they do not define “force, allurement, inducement or fraud”, leaving a lot to interpretation. Thus, while Christian missionaries are booked and detained over complaints from clearly motivated quarters, proponents of ghar wapsi – where the converts are offered lucrative inducements of marriage or getting to choose their caste – seem to have nothing to fear. Such selective criminalisation is problematic in a country where the Constitution grants every citizen equality in the eyes of the law. In this scenario, the government needs to speak up, and assure citizens of all faiths that it will protect their rights. To his credit, Prime Minister Narendra Modi did say, in February 2015, that his “government will ensure that there is complete freedom of faith and that everyone has the undeniable right to retain or adopt the religion of his or her choice without coercion or undue influence. We cannot accept violence against any religion on any pretext and I strongly condemn such violence. My government will act strongly in this regard”. However, the impact of such statements is limited when his government asks schools to stay open on December 25 to mark “Good Governance Day”, or tries to justify a ban on an NGO by saying they were using foreign funds to spread Christianity in India. India belongs to every Indian, and it is shameful for the whole country if some Indians are made to feel vulnerable or unwelcome in their own home, their free practising of their faith made dependent on the “largesse” of one community. It is the government’s job to prevent this from happening, and the government at present is run by the BJP. The party needs to realise that it does not polarise votes, it polarises people, and society reaps its dangerous harvest long after elections are over. No matter how much the BJP otherises minority communities, they will remain a part of India, and achhe din cannot truly be said to have come till they come for every Indian.